In many rural areas in the global South, the number of qualified veterinarians often does not suffice to provide quality animal health services at local level. In these areas, inhabited by livestock and agricultural communities, this deficiency in terms of animal health services leads to certain risks related to poverty, public health and food insecurity and nutrition. To deal with these risks, the approach of community-based animal health services was developed. Selected by their community and in collaboration with private veterinary doctors, the veterinary public services and supporting bodies (projects and NGOs), Community-based Animal Health Workers (CAHWs) provide basic services and give husbandry advice to livestock keepers. They are in charge of disseminating certain farming techniques and methods in order to optimize animal production and play an important role in epidemiological surveillance. 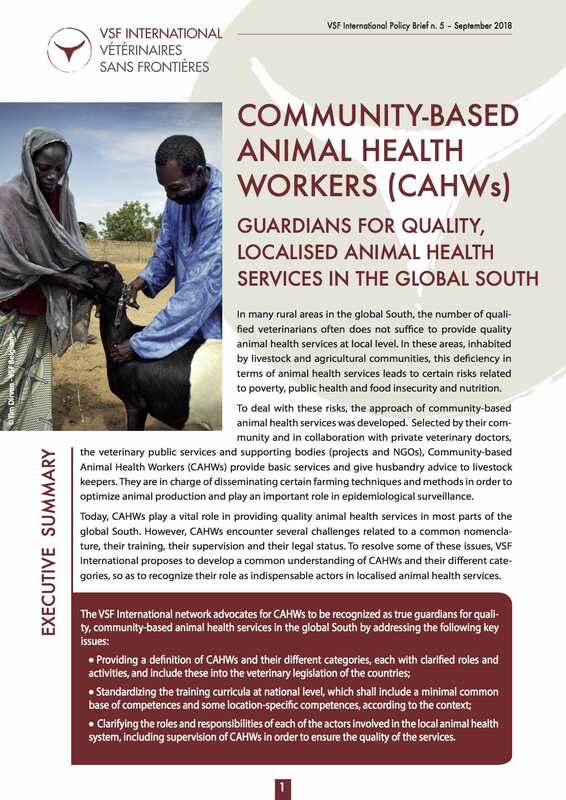 Today, CAHWs play a vital role in providing quality animal health services in most parts of the global South. However, CAHWs encounter several challenges related to a common nomenclature, their training, their supervision and their legal status. To resolve some of these issues, VSF International proposes to develop a common understanding of CAHWs and their different categories, so as to recognize their role as indispensable actors in localised animal health services. Clarifying the roles and responsibilities of each of the actors involved in the local animal health system, including supervision of CAHWs in order to ensure the quality of the services.